Many mathematical models characterizing mechanisms of cell fate decisions have been constructed recently. Their further study may be impossible without development of methods of model composition, which is complicated by the fact that several models describing the same processes could use different reaction chains or incomparable sets of parameters. Detailed models not supported by sufficient volume of experimental data suffer from non-unique choice of parameter values, non-reproducible results, and difficulty of analysis. Thus, it is necessary to reduce existing models to identify key elements determining their dynamics, and it is also required to design the methods allowing us to combine them. Here we propose a new approach to model composition, based on reducing several models to the same level of complexity and subsequent combining them together. Firstly, we suggest a set of model reduction tools that can be systematically applied to a given model. Secondly, we suggest a notion of a minimal complexity model. This model is the simplest one that can be obtained from the original model using these tools and still able to approximate experimental data. Thirdly, we propose a strategy for composing the reduced models together. Connection with the detailed model is preserved, which can be advantageous in some applications. 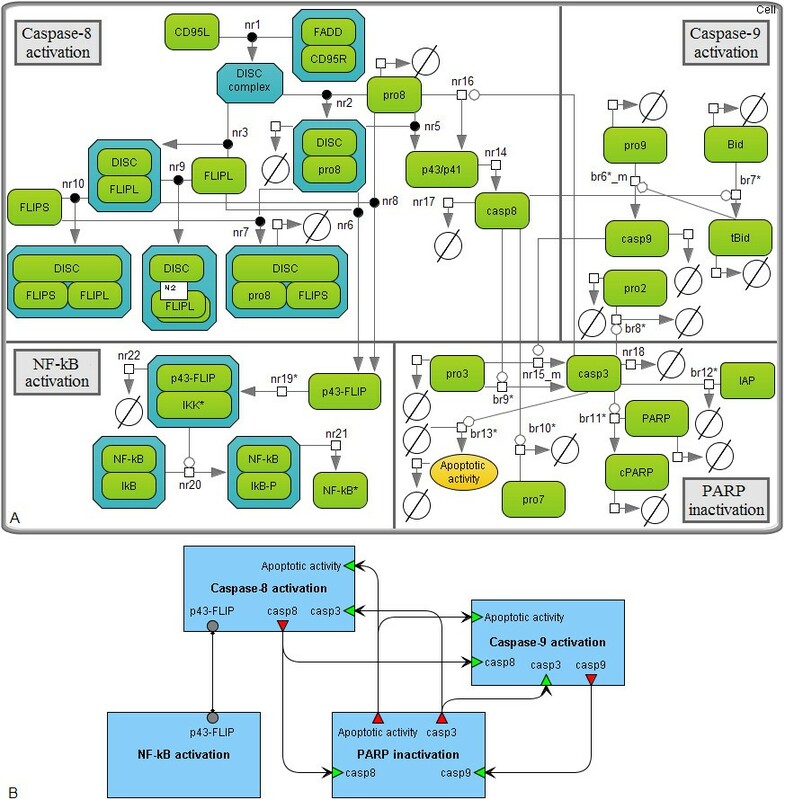 A toolbox for model reduction and composition has been implemented as part of the BioUML software and tested on the example of integrating two previously published models of the CD95 (APO-1/Fas) signaling pathways. We show that the reduced models lead to the same dynamical behavior of observable species and the same predictions as in the precursor models. The composite model is able to recapitulate several experimental datasets which were used by the authors of the original models to calibrate them separately, but also has new dynamical properties. Model complexity should be comparable to the complexity of the data used to train the model. Systematic application of model reduction methods allows implementing this modeling principle and finding models of minimal complexity compatible with the data. Combining such models is much easier than of precursor models and leads to new model properties and predictions. Systems biology aims to study complex interactions in living systems and focuses on analysis and modeling their properties. Mathematical modeling provides several ways to describe biological processes based on experimental information of different kind. However, creation of detailed models not supported by enough experimental data often makes their analysis and interpretation difficult . Several aspects of the same process can be modeled using different levels of abstraction involving different reaction chains, chemical kinetics, and incomparable sets of parameters. Such models are difficult to merge. Meanwhile, merging is an important approach for creation of complex models. Thus, development of efficient methods and software, allowing us to combine models, is the object of intense study in systems biology. In our work, we focused on the fact that, generally, complexity of models is not comparable to the volume of experimental data used to adjust their parameters. Due to this fact, we turn to the methods of model reduction allowing us to minimize model’s complexity without affecting the model simulation dynamics. Model reduction is a well-established technique in many fields of biochemical research and engineering. 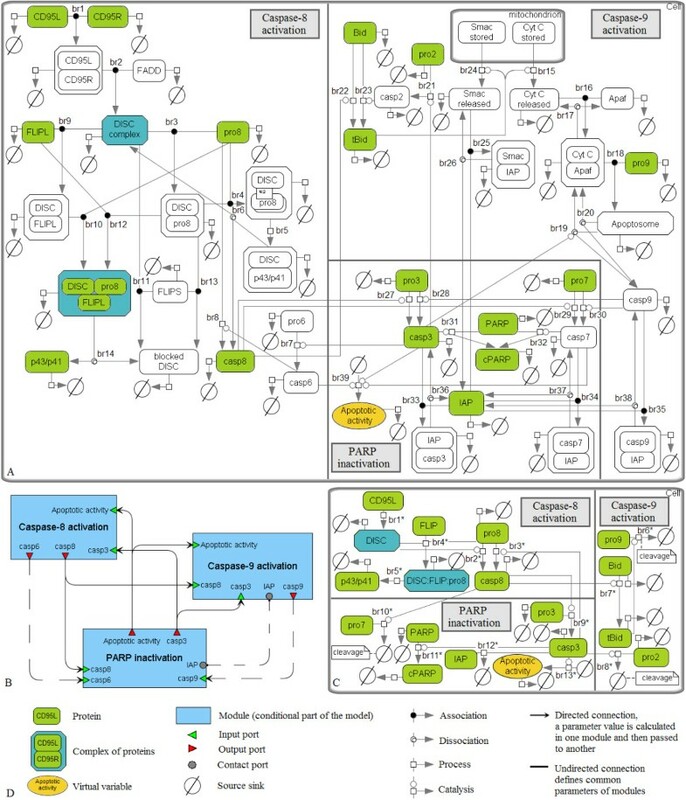 It has been used for many years in chemical kinetics (for reviews, see [2–4]) and has already found multiple applications in systems biology, including discrete modeling  and modeling of metabolic pathways [6, 7]. The principles of this technique have been applied in computational biology  and implemented as a part of widely used pathway simulators such as BioUML , BIOCHAM , COPASI , and GINsim . Model reduction led to new insights in mechanisms of translation regulation by microRNAs [13, 14] and was applied for analysis of such signaling pathways as JAK-STAT , NF-κB , and EGFR . In our investigation, we used the principles of model reduction to construct reasonably accurate minimal size approximations of two different models describing the CD95 signaling pathways [18, 19]. 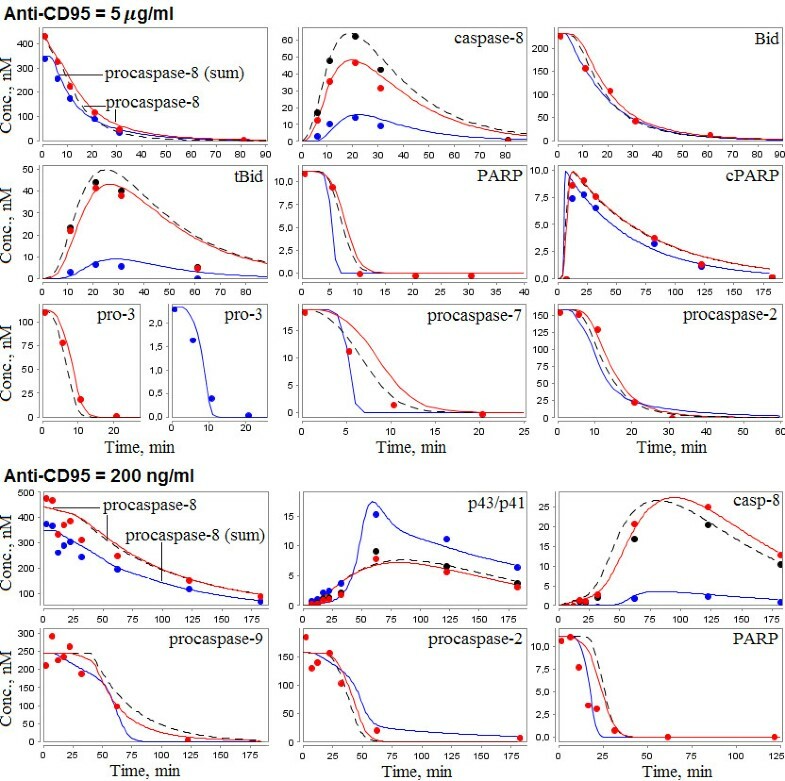 The first model explores pro-apoptotic properties of CD95 after stimulation by its natural ligand CD95L or by agonistic antibodies anti-CD95 implying formation of the death-inducing signaling complex (DISC) [18, 20]. DISC consists of oligomerized CD95, death domain-containing adaptor FAS-associated molecule (FADD), procaspases-8 and −10, and two isoforms of cellular FLIP (CFLAR) protein (cFLIP long and cFLIP short). Caspase-8 leads to activation of effector caspase-3 directly (type I cells) or via stimulation of cytochrome C release from the mitochondria (type II cells) . The latter step requires formation of the apoptosome complex and activation of caspase-9. Once activated, caspase-3 cleaves poly(ADP-ribose) polymerase (PARP), thereby making the apoptotic process irreversible. The second model describes the state when CD95 not only activates the pro-apoptotic pathway, but also induces transcription factor NF-κB that is an important regulator of cell survival functioning . This is possible due to cFLIPL cleavage in the DISC complex. The cleaved p43-FLIP directly interacts with the IKK complex and activates it. The activated IKK performs phosphorylation of the IκB protein and thereby frees NF-κB. The authors of the models have evaluated concentration changes of major apoptotic molecules by Western blot analysis and represented them as relative values at given time points. Using the systematic methodology  implemented in the BioUML software, we reduced the models so that they still satisfy these data. This allowed us to simplify the overlapping components of the models and find a way for their composition. dC t dt = N · v C , K , t , C 0 = C 0 . N · v C ss , K , t = 0 , lim t → ∞ C i t = C i ss . where ω min = min i ω i , weights ω i = r i − 1 · ∑ j C i exp t ij 2 are calculated as mean squared values of experimental concentrations for each variable and the normalizing factor ω min /ω i is used to make all concentration trajectories to have similar importance. Reducing kinetic model is possible when some quantities are much smaller than other quantities and can be neglected. Usually, this implies some qualitative relations (much bigger, much smaller) between model parameters. When these relations satisfy certain rules, we can approximate the detailed model by a simpler one. If the parameters are (approximately) determined, as in our case, we find an approximation specific for a region of the parameter space. However, if we want to investigate the model behavior for the entire space, we need to decompose it into regions characterized by asymptotically different behaviors of the dynamical systems. Afterwards, a specific reduction should be performed for each region (Figure 1). Schematic representation of the model reduction technique. A model consisting of four species (A, B, C, and D) and two reactions (r1 and r2) was reduced taking into account the relations between time-dependent concentrations C A (t) and C B (t), as well as reaction rates vr1(t) and vr2(t). In the case when C A (t) ≫ C B (t), the concentration of A can be considered constant for some period of time. The same simplification could be applied to B. If vr1(t) ≈ vr2(t), then C could be removed, resulting in direct formation of D triggered by the binding of A and B only. We define the minimal complexity model as a reduced model with the minimal number of elements (species and reactions) so that the deviation function value (3) calculated for the reduced model is different from the original model no more than 20%. Such threshold is explained by the fact that in this work we considered experimental data obtained by Bentele et al. and Neumann et al. using Western blot technology with the standard deviation 15-20%. Reduction of mathematical model complexity is achievable by different methods . Description of the methods directly used in our work is provided below. (MR1) Removal of slow reactions. We say that reaction r1 is much slower than reaction r 2 , v r 1 t ≪ v r 2 t if max t v r 1 t < k · max t v r 2 t , where k=10-2. When such reactions do not affect experimental dynamics of species, we neglect them. Note, that in some cases, it is sufficient to consider k = 10−1 or even k = 1.
where ɛ is small parameter. We consider the approximation ɛ → 0 resulting in the equation N f · v f (C, K, t) = 0. Thus, the chain of reactions S → I → P with a quasi-stationary species I can be reduced to the form S → P.
where C S t = C S 1 t = C S 2 t , C P t = C P 1 t = C P 2 t and k = k1 = k2. Note, that in this example lumped variables C S 1 t , C S 2 t and C P 1 t , C P 2 t are linearly dependent: however, this is not required in general case. For conditions on lumpability in monomolecular reaction networks, see . then we can replace one of them with another in all kinetic laws of the model. where the enzyme concentration is a dynamic variable allowing to use the same kinetics in different regions of the phase space. If Km ≫ C S (t), then we can reduce this formula to the form: v r t = k · C S t · C E t Km . On the other hand, if C S (t) ≫ Km, then (5) can be replaced by the equation v r (t) = k · C E (t). v r t = k · C S 1 t · C S 2 t .
When C S 1 t ≫ C S 2 t for t ∈ [0, T], the formula (6) can be replaced by the linear equation v r t = k · C S 1 0 · C S 2 t . The time T of validity of such pseudo-lineary approximation is defined as a period during which the relative change of C S 1 t does not exceed some ε, i.e. k ∫ 0 T C S 2 t dt < ε . One way to perform the model reduction is to apply the foregoing methods in the numerical order (Figure 2). Note that the methods MR5 and MR6 are of the same type, so it does not matter which one to use first. This way assumes that we calculate the value of the distance function (3) at each reduction step to test whether approximation of the experimental data is still within allowable limit or not. 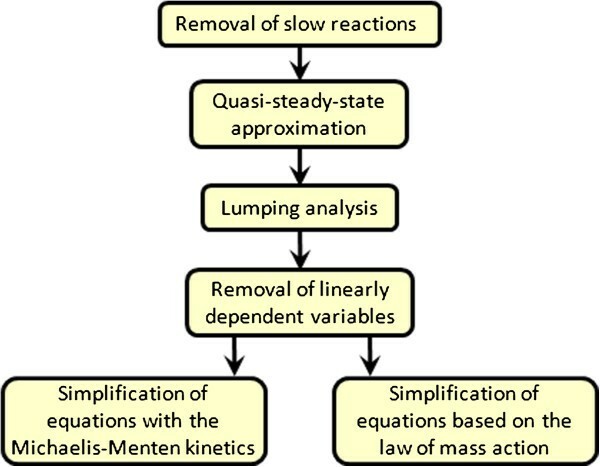 Flow chart of the model reduction. The methods of model reduction are presented in the order of their application. The last two methods are of the same type, so this is a choice of the systems biologist which one to use first. AIC = χ 2 + 2 · K .
σ ij 2 = 1 4 ∑ k = − 2 2 C i t i , j + k − C i exp t i , j + k 2 . For j + k < 0 and j + k > r i we assumed C i (ti,j+k) = C i exp (ti,j+k) = 0. Models can be compared using the Akaike criterion, if they approximate the same experimental data. When the AIC value of one model is less than of others, we say that this model is simpler in terms of this criterion. where n exp determines the number of experimental points. Steady-state analysis finds values of species concentrations according to the rules (2). It is desirable to reduce a model so that steady-state concentrations of all experimentally measured chemical species have not changed significantly. where n p is the number of all parameters |K| or the number of parameters retained after the model reduction. Considering the mathematical models of CD95 signaling pathways [18, 19], we decomposed them into functional modules. This step allowed us to identify overlapping components of the models and simplify their analysis. We defined a module as a submodel (including several species, reactions and parameters of the model) with input, output and contact ports. The first two types of ports characterized variables calculated in one module and passed to another through a directed connection. The contact ports declared common variables of modules via undirected connections (for more details of modular modeling, see ). where k36act, k7act, Km367act ∈ K. The variable x aa specifies a process of degradation in the model introduced as an exponential decay function f degr (x aa ). This function is defined by the formula k d · x aa 2 + k ds with k d ,k ds ∈ K for all active caspases and complexes containing their cleaved products, and by the formula k d · x aa 2 for all other molecules besides cPARP (cleaved PARP), where f degr (x aa ) is constant. All species in the model are degraded with the exception of cytochrome C and Smac stored in the mitochondria, whose concentrations are constant. The model by Bentele et al. and results of its reduction. A. The original model decomposed into modules according to three steps of apoptosis: activation of caspases-8 and -9 and inactivation of PARP. The species retained after the model reduction are colored. B. The modular view of the model. The dashed connections were deleted during the model reduction. C. The minimal reduced model. D. The graphical notation used for representation of the models A-C.
where t trigger is the time when tBid concentration reaches a value of Bcl-2/Bcl-XL, t release is the start time of release and k contr is the contraction coefficient. Prototypes of parameter notations in the original Bentele’s model are listed in Additional file 1: Table 1S. Abbreviations used in the table represent МA – mass action kinetics and M-M – Michaelis-Menten kinetics. The column with rates includes rate orders for the fast/reduced activation scenarios. The model comprises 43 species (including x aa ) and 45 kinetic parameters, which the authors estimated based on the experimental data obtained by Western blot analysis for the human cell line SKW 6.4. Cells were stimulated by 5 μg/ml and 200 ng/ml of anti-CD95 (fast and reduced activation scenarios, respectively) and dynamics of several proteins (Bid, tBid, PARP, cPARP, procaspases-2, -3, -7, -8, -9, cleaved product of procaspase-8 p43/p41, and caspases-8) were measured. We could not reproduce the dynamics of the original model using the parameter values provided by the authors. In particular, there was too rapid consumption of procaspases-2, -3, -7, -8 in the case of 5 μg/ml of anti-CD95 and procaspases-2, -9 in the case of 200 ng/ml. 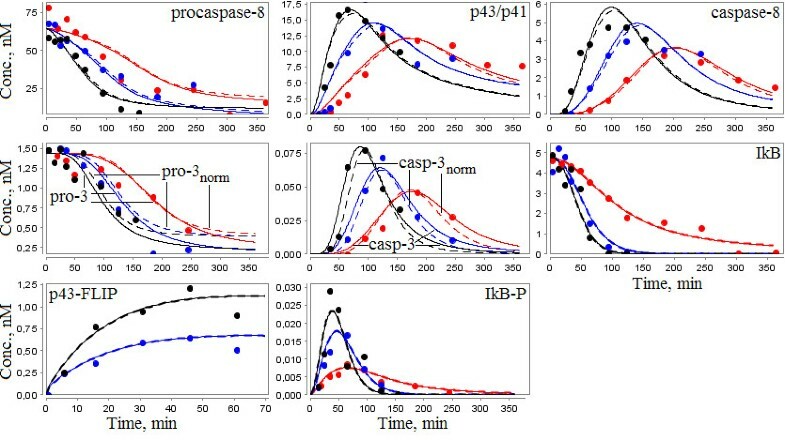 Degradation rates of procaspase-8 and caspases-8 was insufficient for both activation scenarios. Thus, we had to make several modifications of the original model to obtain the same dynamics as described in the original paper. Namely, we multiplied the rate constants of all the bimolecular reactions by the value 5∙ 10-5 and specified k d equal to 3.56 min-1 and 0.62 min-1 (instead of 0.891 min-1 and 0.184 min-1) for fast and reduced activation scenarios, respectively. The model by Neumann et al. includes 23 species, 23 reactions constructed according to the law of mass action, and 17 kinetic parameters (Figure 4A). It reproduces experimental measurements of 8 entities (total amount of procaspase-8, its cleaved product p43/p41, caspase-8, procaspase-3, caspase-3, IκB-α, phosphorylated IκB-α and cleaved p43-FLIP) obtained using Western blot technology for HeLa cells stably overexpressing CD95–GFP and treated with three different concentrations of agonistic anti-CD95 antibodies (1500, 500 and 250 ng/ml). This is the reduced model suggested by the authors for description of the CD95-mediated pathways of cell death and NF-κB activation. Model reduction was based on intuition about what is important in the biochemical mechanisms. It was performed as long as the parameter estimation procedure (repeated after each step of the reduction) was able to provide a good fit of the experimental data. Particularly, the details of some complex formations were omitted as well as some non-measured species were removed. The authors submitted the model to the BioModels database . Thus, we had no problems reproducing it. The original model by Neumann et al. and results of the model reduction. A. 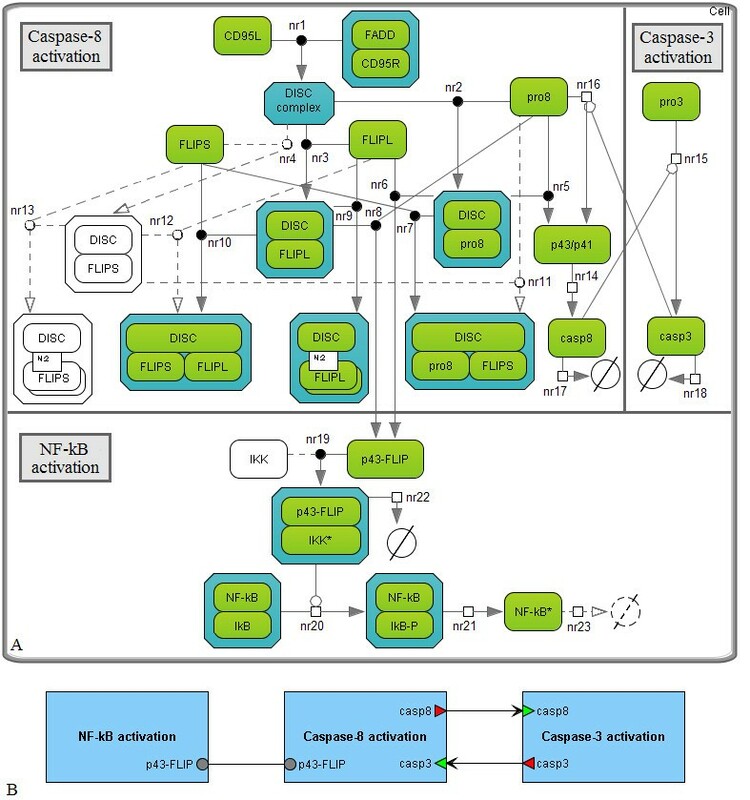 The original model decomposed into modules according to three steps of the CD95 signaling pathways: activation of caspase-8, pro-apoptotic pathway resulting in caspase-3 activation and anti-apoptotic pathway regulated by NF-κB. The species retained during the model reduction are colored; reactions are represented by solid lines. B. The modular view of the model. Activation of caspase-8 and p43-FLIP (product of cFLIPL cleavage) occurs at the DISC complex and triggers simultaneous processes of cell death and survival. d x aa dt = k 36 act + 0.18 · k 7 act K m 367 act · 1 − x aa · C casp 3 − k dd · x aa . 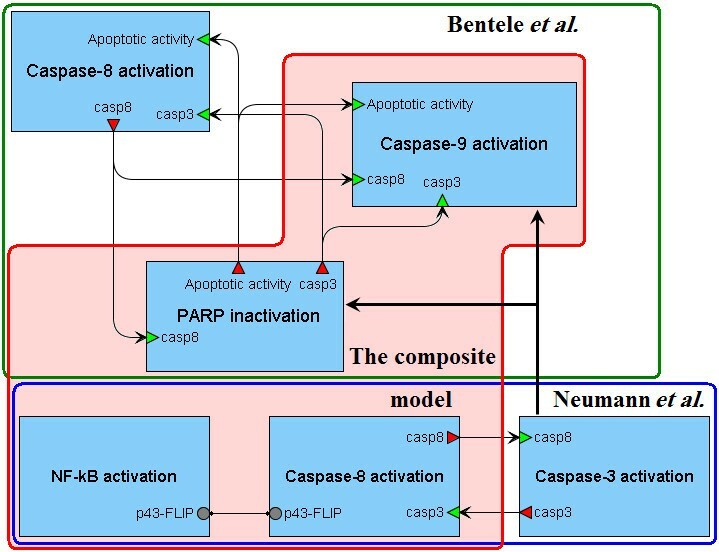 After that we decomposed the model into modules (Figure 3B) corresponding to three biological steps: activation of caspase-8, cytochrome C-induced activation of caspase-9 and PARP cleavage down-regulated by these caspases. Below we provide detailed description of the reduction process of all modules. The process is based on the flow chart represented in the Figure 2. If it is enough for a reader to have a general idea of model reduction without going into full details, we suggest to go directly to the last two paragraphs of this section, where you find the summary of the model reduction procedure. Caspase-8 activation module includes 20 species and 14 reactions (besides the reactions of degradation), which could be divided into three groups: cleavage of procaspase-8 at the DISC complex, its activation triggered by caspase-3, and inhibition of complexes containing DISC by cFLIPL and cFLIPS (Table 1, Figure 3A, reactions br1-br14). Firstly, we eliminated slow reactions br12 and br13 according to the method MR1. Next, we applied the quasi-steady-state analysis (MR2) to the module and removed quasi-stationary intermediates CD95R:CD95L, DISC:pro8, DISC:pro82, DISC:p43/p41 and DISC:cFLIPL. Thus, in particular, we got two main reactions instead of br1-br6: fast formation of the DISC complex (Table 1, Figure 3B, br1*) and slower activation of caspase-8 in this complex (br2*). where cFLIP indicated two isoforms cFLIPL and cFLIPS so that C cFLIP = C cFLIPL = C cFLIPS . where k38 = 0.145 · k68 and Km38 = Km68. Analysis of this kinetic law for low level of CD95L ensured that Cpro8 ≫ Km38. In addition, in the case of the fast activation scenario the value of v br3* was much lower than the rate of caspase-8 activation mediated by CD95. Thus, we established v br3* = k 38 ·C casp3 without significant changes in the results of the model simulation (MR1, MR5). where c = 0.59 was the coefficient of linearity. d C pro 9 dt = − 0.59 · 1 − f release t · C Cyt C stored 0 · k Apop · C pro 9 . C pro 9 = C pro 9 0 · f release t · exp k contr · t − 1 + 1 exp k contr · t 0.59 · C Cyt C stored 0 · k Apop k contr . v br 7 * = k 8 Bid / K m 8 Bid · C casp 8 · C Bid . The module of PARP inactivation contained 13 species (including the virtual species x aa ) and 11 reactions (excepting reactions of degradation). Six reactions (activation of caspases-3 and -7 by caspases-8 and -9, and cleavage/inactivation of PARP) were based on the Michaelis-Menten kinetics (br27-br32), four reactions reproduced the reversible inhibition of caspases-3 and -7 based on the law of mass action (br33, br34, br36, br37), and one corresponded to the production of x aa (br38), simplification of which was discussed above. We deleted slow reactions of casp3:IAP and casp7:IAP complexes dissociation and ignored slow degradation of procaspase-7 and IAP. Then analyzing the cleavage of procaspases-3 and -7, we eliminated reactions triggered by caspase-9, which were slower in comparison to the similar reactions induced by caspase-8. For the same reason we ignored the reaction of PARP inactivation by caspase-3 (MR1). Thus, the CD95-signaling model consisting of 43 species (including one virtual species), 80 reactions and 45 kinetic parameters was approximated by a model with 18 species, 26 reactions and 25 parameters, except the constant concentration of Cytochrome C (Figure 3C). Figure 5 shows the comparison of simulated concentrations of these models with experimental dynamics obtained by Bentele et al. for the 11 species mentioned above. Since this dynamics was expressed in arbitrary units, we uniquely translated it into precise values for all proteins with non-zero initial values. However, for such molecules as caspase-8, p43/p41, tBid and cPARP, precise values directly depended on the concentration levels at the end or in the middle of time series. Accordingly, we computed these levels during the model reduction and recalculated experimental dots if necessary. Results of the composite model approximation to the experimental data by Bentele et al. The experimental data (dots) were obtained by Bentele et al. using Western blot analysis and expressed as relative values. Once simulated values (curves in the figure) were found for the original Bentele’s model (solid red), the reduced model (dashed black) and the composite model (solid blue), experimental points were recalculated taking into account these values. Wherever blue or black dots are missing, they coincide with the red dots. Note that considering the concentration of procaspase-8 in the original model, we observed experimental dynamics for the separate species only, but not for the total amount as expected from experiments. Thus, validating parameters of the composite model, we evaluated the total amount of procaspase-8. Species without experimental evidence (CD95L, DISC, cFLIP, DISC:pro8:cFLIP, IAP, caspase-3 and virtual species x aa ) and reactions br1*-br13* directly affect the simulated dynamics of the experimentally measured concentrations (Table 2). Thus, further reduction of the model by removing these elements is impossible. Regarding the degradation process, we agree with Bentele et al. that experimental data cannot be matched if this process is fully ignored. Actually, if we remove any of the retained reactions of degradation, then excepted concentration dynamics will be impaired. Thus, we found the minimal complexity approximation of the original model. Activation of caspase-8 in the DISC complex. In the case of a high ligand concentration, DISC is a slow species, so reactions br1* and br2* cannot be combined. Activation of caspase-8 via the negative-feedback loop. When the concentration of CD95L is reduced, the rate of br3* is an order of magnitude higher than the rate of br2*. Thus, activation of caspase-8 is mainly caused by caspase-3. Cleavage/activation of procaspase-2 is confirmed by the experimental data. Caspase-3 activation plays a crucial role in the cleavage of procaspases-2, -8 and PARP. PARP inactivation is confirmed by the experimental measurements of PARP and cPARP concentrations. Inhibition of the DISC complex. cFLIP blocks the activity of DISC preventing a significant increase of caspase-8 concentration. This conclusion is consistent with the observations by Bentele et al. asserting that down-regulation of cFLIP resulted in cell death occurring already upon low concentration of anti-CD95 (1 ng/ml). Production of blocked p43/p41, whose concentration is detected by the experimental data. Activation of Bid and cleavage of procaspases-7 and −9. These reactions determine dynamics of the mentioned species in agreement with the experimental data. Inhibition of caspase-3. In the case of the reduced activation scenario, IAP prevents caspase-3 from reaching a significant level and, therefore, blocks significant increase of caspase-8 due to br3*. The virtual variable x aa specifies the process of degradation. “Experimental data” in this table refers to the data obtained by Bentele et al..
As was mentioned above, Neumann et al. simplified their model in order to reduce the large number of free parameters. The authors noted that further simplification of the model was not possible because the model fit significantly decreased. However, we removed slow reactions (nr4, nr11-nr13, Figure 4A) using the method MR1, and removed the reaction of NF-κB degradation (nr23), which was not significant for reproducing the experimental data of the original model. Note that we retained the slow reactions nr6 and nr7, the former of which regulates apoptosis inhibition in the case of high levels of cFLIPL and procaspase-8 in accordance with the precursor model prediction (see the analysis of the predictions below), and the latter of which will be required to combine this model with the Bentele’s model hereafter. v nr 19 * = k p 43 − FLIP _ IKK · C IKK 0 · C p 43 − FLIP . Therefore, we reduced the number of model species from 23 to 20, the number of reactions from 23 to 18 and the number of kinetic parameters from 17 to 15 (besides the constant concentration of IKK). These modifications did not change the fit to the experimental data provided by Neumann et al. (Figure 6). Comparison of the composite model simulation results with the experimental data by Neumann et al. The simulated concentrations of the original and reduced models (solid lines), as well as the simulated values of the composite model (dashed lines) were obtained by Neumann et al. for three different concentrations of anti-CD95: 1500 ng/ml (black), 500 ng/ml (blue), and 250 ng/ml (red). We did not recalculate the relative experimental data (dots) as in the case of the Bentele’s model due to a slight difference between the results of the composite and precursor models. An exception was made for values of procaspase-3 and caspase-3, which were normalized for the composite model by the term 0.1 for convenience of the visual plots comparison. Analysis of the reduced models based on the Akaike criterion (7) confirmed that they had lower complexity than the original models (Table 3). The difference between the mean AIC coefficients (8) of the models decreased by 60%, relative to the initial value. In addition, the reduced Neumann’s model better approximated experimental data. Therefore, we used it as the basis for the model composition. type I and type II cells conform to different reaction chains of caspases-3 activation . The first reaction of this chain had the same kinetic law as br7*. The other reactions represented br6* and nr15 with kinetics modified using the law of mass action. Such modification of br6* was necessary to get the slow increase of caspase-3 concentration experimentally described by Neumann et al.. Modification of nr15 consisted in substitution of Ccasp9 for Ccasp8 . Secondly, we supplemented the Neumann’s model with reaction of caspase-3 inhibition by IAP and evaluated parameters in this reaction together with parameters in (17) using the corresponding data by Neumann et al. and optimization tools of BioUML . Thirdly, we analyzed the changes of the initial concentrations and parameters of the derived model required to reproduce the Bentele’s experimental data fixing levels of procaspases-3, -8, cleaved product p43/p41, and caspase-8 (Table 4). All the changes, except step 4, agreed with assumptions (A) and (B). To reproduce the species dynamics, we had to increase the initial concentration of procaspase-3 in the case of HeLa cells by an order of magnitude. Case: anti-CD95 = 5 μg/ml Procaspase-8 is cleaved in about 30 minutes. This is possible only if DISC concentration reaches a level sufficient to accelerate the reaction nr2. [102, 103], 442.821, Bentele et al. Case: anti-CD95 = 5 μg/ml The concentration of caspase-8 should reach its maxim value in about 20 minutes. Case: anti-CD95 = 200 ng/ml As mentioned in Table 2, activation of caspase-8 is mainly caused by caspase-3 and, therefore, is delayed approximately for 30 minutes. Since reactions nr2 and nr5 have the same rates, we cannot observe the delay, but when we reduce the rate of nr5, we can. The latter is achieved by upregulation of the DISC:pro8 complex inhibition. [101, 102], 65.021, Bentele et al. Case: anti-CD95 = 200 ng/ml Preventing a rapid growth of caspase-8 concentration. Case: anti-CD95 = 5 μg/ml Improving approximation of the experimental data by Bentele et al. [100, 101], 1.443, Neumann et al. Case: anti-CD95 = 200 ng/ml Reproducing the experimental dynamics of procaspase-9. 231.760 (Bid), 245.101 (pro-9), Bentele et al. Finally, we combined the modules of caspase-8 and NF-κB activation with the modules of caspase-9 activation and PARP inactivation (Figure 7). For this purpose, we modified the last two modules based on (17) and refitted their parameters as well as the concentrations mentioned in Table 4, using experimental data by Bentele et al. For better fit we also supplemented the model by degradation reactions of some species (procaspase-9, caspase-9, DISC:pro8 and DISC:pro8:FLIPS). Creation of the composite model. The modules of caspase-8 and NF-κB activation were taken from the reduced Neumann’s model and combined with the modules of caspase-9 activation and PARP inactivation isolated from the reduced Bentele’s model. In addition, two last modules were supplemented by reactions from the modified module of caspases-3 activation. The resulting composite model (Figure 8) consists of 30 species (including one virtual species), 38 reactions (including 15 reactions of the species degradation) and 30 kinetic parameters, except for the constant concentration of IKK (Additional file 1: Table 2S, Additional file 1: Table3S, Additional file 1: Table4S). The model showed a good fit between the simulation results and the experimental data (Figures 5 and 6). The composite model of the CD95- and NF-κB-signaling. A. The model integrating pro- and anti-apoptotic machinery described by the models by Neumann et al. and Bentele et al. Reactions with the “nr” titles were taken from the first model, while the “br” titles indicate reactions from the second one. The “*” symbol marks reactions defined in the reduced models. The subscript “m” means that reaction was modified for the models composition. B. The modular view of the model. Activation of caspase-8 triggered by CD95 leads to NF-κB activation and cell survival, on the one hand, and PARP cleavage resulted in the cell death, on the other hand. Calculation of the mean AIC coefficient for this model revealed that it has the same level of complexity as the reduced models (Table 3). We also noted that reduction of both models did not significantly alter the steady-state concentrations (Additional file 1: Table 5S, Additional file 1: Table6S). However, the composite model has different steady-states, which are more stable according to the mean sensitivities (9) in the cases of SKW 6.4 cells and HeLa cells stimulated with 250 ng/ml of anti-CD95 (Additional file 1: Table 7S). Analyzing the models constructed by Neumann et al. and Bentele et al., we divided predictions made by them into two groups: qualitative and quantitative. The first group concerned the model network and described mechanisms of the protein-protein interactions. It is this group to which we assigned the experimentally validated Neumann's predictions that processed caspases are not required for NF-κB activation, as well as that pro-apoptotic and NF-κB pathways diverge already at DISC. The corresponding network of reactions was preserved in the reduced model. Thus, the prediction remained valid. The second group of predictions characterized behavior of the models after changing concentrations of some species, such as CD95L, CD95R, procaspase-8, and inhibitors cFLIPL, cFLIPS, and IAP. Analyzing the predictions of the models by Neumann et al. and Bentele et al. listed in the Tables 5 and 6 respectively, we concluded that the reduction of the first of them did not alter the species dynamics (Additional file 1: Table 8S). For the second reduced model, we detected some minor changes in the predictions. However, in general, the model behavior remained in a good agreement with the Bentele's experiments (Additional file 1: Table 9S). Predictions by Neumann et al. The concentration of anti-CD95 required for the apoptosis induction (the apoptotic threshold), is within the range of 30–100 ng/ml. This range remains the same for CD95 decreased by about 12-fold. The simulation time, which we used to reproduce this prediction, was 60 hours. The decreased receptor number results in impairment of both CD95- and NF-κB-signaling pathways. To test this prediction, Neumann et al. considered levels of caspases-8 cleavage and IκB-α degradation for the original (solid lines) amount of CD95 and the amount decreased by about 12-fold (dashed lines). The concentration of anti-CD95 was 500 ng/ml. Along with increasing the concentration of anti-CD95 from 500 ng/ml to 1500 ng/ml, p43/p41 peaks earlier, while there is almost no difference for p43-FLIP. Increased concentrations of cFLIPS inhibit both apoptotic and NF-κB pathways, although p43-FLIP generation is inhibited at a lower threshold than p43/p41 generation. Increasing the concentration of cFLIPL leads to a steep increase in p43-FLIP generation until it reaches a maximum, after which the curve drops. Lowered levels of cFLIPL result in very little p43-FLIP but almost unchanged levels of p43/p41. At very high concentrations of cFLIPL no p43-FLIP is generated. This drop-off was not observed experimentally by the authors. High cFLIPL or low procaspase-8 concentrations cause suppression of apoptosis. The figures show the same dependence as considered in the previous prediction, but with caspases-3 instead of NF-κB. All the predictions marked with an asterisk were experimentally tested by Neumann et al. and confirmed, unless otherwise noted. The simulation time in predictions 3–7 was 360 min. The concentration of anti-CD95 considered by the authors in predictions 4–7 was 1000 ng/ml. − the measured death rate for 10 ng/ml of anti-CD95 was 20-30%. − cPARP concentration rises dramatically within an extremely narrow interval of anti-CD95 levels overcoming the apoptotic threshold. − cPARP concentration rises in a smooth manner along with the increase of anti-CD95 level. Experiments by Bentele et al. : down-regulation of cFLIP in SKW 6.4 cells by addition of cyclohexamide resulted in cell death (40% for 1 day) already upon 1 ng/ml of anti-CD95. The level of cFLIP was decreased to 70%. − decreasing the initial concentration of cFLIP by more than 51% and 49% for the original and composite models, respectively, leads to cell death upon stimulation by 1 ng/ml of anti-CD95. Experiments by Bentele et al. : in the 10 ng/ml activation scenario, a significant increase of caspase-8 was observed after more than 4 hours. Original (red) and composite (blue) models: anti-CD95 concentrations which are slightly above the apoptotic threshold result in caspase-8 activation after a delay of many hours. The figure shows peak times of caspase-8 concentration exceeding 0.1% of the initial procaspase-8 level. − high concentrations of IAP prevent a significant increase of caspase-3 even for high concentrations of the ligand. − high concentrations of CD95L lead to cell death. The figures show logarithmic dependence of the maximal caspases-3 concentration on initial values of IAP and CD95L. The simulation time was 2880 min (2 days) in all predictions. The apoptotic threshold in the prediction 1 is the concentration of anti-CD95 after which cPARP amount exceeds 10% of the initial PARP level. Considering the predictive ability of the composite model, we found that in the case of HeLa cells it was completely preserved (Table 5). In the case of SKW 6.4 cell line, we estimated the value of degradation rate parameter k d based on the experimental observations by Bentele et al. for 1–10 ng/ml of anti-CD95 (Table 6). When performing simulation experiments of the model for this cell line, we used three different values of k d depending on whether the initial concentration of CD95L was within the range 1–100 ng/ml, within the range 100–1000 ng/ml or greater than 1000 ng/ml (Additional file 1: Table 3S). Analyzing the model predictions, we detected differences in the behavior of the Bentele’s and the composite models (Table 6). The first of them describes a threshold mechanism for CD95-induced apoptosis implying that this process is completely stopped when CD95L concentration is below the critical value. However, the model predicts a sharp increase of cPARP immediately when the level of CD95L exceeds the threshold (Table 6, № 1). In contrast, the composite model shows a gradual increase of cPARP with increase of the ligand level. To determine the apoptotic threshold in this case, we found concentration of CD95L for which cPARP ratio is equal to 10% of the initial PARP amount . As in the original model, this concentration was in the range of 1–10 ng/ml. Additionally, the models revealed sensitivity of the threshold to the concentration of cFLIP (Table 6, № 2). Both of them predicted the cell death phenotype upon stimulation by 1 ng/ml anti-CD95 and the level of cFLIP decreased by ~50%. The next prediction, which we observed for SKW 6.4 cells, considers a delay of caspase-8 activation caused by low concentrations of anti-CD95 (Table 6, № 3). The maximal delay predicted by the Bentele’s model was about 2500 min, whereas the composite model detected a much lower value (700–800 min). Analysis of dependence of caspase-3 concentration on initial values of IAP and CD95L (Table 6, № 4) also demonstrated differences in the models’ predictions. Thus, low level of IAP (less than 1 nM) in the original model results in complete cell death. However, under the same condition the composite model shows a smooth increase of caspase-3 levels with CD95L changing from 0.3 nM to 1000 nM. If the amount of the ligand is less than 0.3 nM, IAP blocks apoptosis completely. In addition, the Bentele’s model predicts that high concentration of IAP prevents a significant increase of caspase-3 even for high levels of the ligand, whereas in the composite model high concentration of CD95L leads to cell death. We analyzed a set of parametric constraints which allowed us to reduce the precursor models (Additional file 1: Table 10S). Following them, we can recover a detailed description of the investigated process. Connection of the composite model with the original model by Neumann et al. was preserved, whereas with the original model by Bentele et al. it was partially lost since the chains of species interactions were changed for the sake of combining the models together. In particular, the pathway of caspase-8 activation in DISC was derived from the Neumann’s model as well as the reaction chain of procaspase-9 cleavage was modified. However, following the constraints of Additional file 1: Table 10S, we can complete the composite model with such reactions as Bid truncation by caspase-2 and PARP cleavage triggered by caspase-7. We can also recover the details of caspase-9 activation mediated by cytochrome C and Smac release from mitochondria but with altered kinetics of release. For now, the question of admissibility of such modifications as well as extension of the composite model based on other apoptosis models remains open and is a challenge for further research. In this paper, we considered two approaches to development of mathematical models of cell fate decisions. The first concerns the methodology of model reduction and involves approximation of one model by another one of lower dimension without affecting dynamics of experimentally measured species. The second implies composition of the models and aims at reproducing experimental dynamics of all precursor models. There are many advantages of working with low-dimensional models . In particular, the researcher has a clear vision of the most important biochemical reactions taking place in the modeled system as well as better understanding of them. Low-dimensional models are easier to analyze and faster to simulate. This helps to save time and enhances productivity. The main limitation of model reduction consists in loss of biological information. However, it should be noted that even if some information (for example, about very slow biochemical reactions) may be lost, it can result in a more clear understanding of the most important interactions and allows focusing on the decisive processes in the model, predictive ability of which is reasonably preserved. Hence, this limitation can be transformed into an advantage. 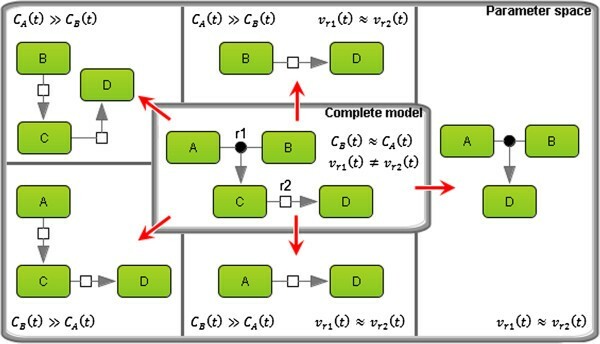 Model composition aiming at getting a single model from several ones is useful because in such a case a computational biologist is able to investigate the composite model behavior under different conditions that cannot be performed in the precursor models separately. For example, our model allows studying the role of p43-FLIP or IAP in the type I SKW 6.4 or type II HeLa cells, respectively, that might become a task for the future work. In other words, we constructed the model that describes pro- and anti-apoptotic signal transduction in different cell types with reasonable accuracy instead of a couple of different models. Whenever necessary, some reaction chains and parameters can be switched off giving opportunity to simulate a certain type of cells. In addition, the composite model covers experimental data obtained from all precursor models, each of which separately satisfies its own data only. Model composition sometimes causes modification of some properties of the initial models, resulting in new testable predictions. In our case, such predictions were related to SKW 6.4 cells, and some simulation results were different from the corresponding results of the original Bentele’s model. Nonetheless, the composite model behavior remained in good agreement with experimental data used in modeling by Bentele et al. Thus, the question of what model (original or composite) is more realistic requires further experimental investigation. inability to make accurate predictions. Model reduction allows solving some of these problems. In particular, reducing the number of model elements, we reduce the overlapping parts as well. This may be essential for direct combining of models. In addition, the complexity of the reduced model become comparable with the complexity of available experimental data. Therefore, the risk of model overfitting is decreased. In the case when two models are directly related (for example, one model was emerged from the other), their composition may be significantly easier in comparison to composition of quite different models. In our work, the models by Bentele et al. and Neumann et al. are not directly related, as it could be expected as these models were constructed in the same research group. For example, they use different reaction chains of caspase-8 activation and different values of kinetic parameters in the overlapping reactions. Another quite useful principle that we used in modeling was modular structure of the developed model. This principle provides flexibility for future extensions. Thus, we are planning to extend the composite model and supply it with modules and data from studies of TRAIL [31–33] and TNF-α [34, 35] signaling, apoptosome-dependent caspase activation  and p53 oscillation system . It is noteworthy that the model by Laussmann et al., describing TRAIL-induced activation of caspase-8, emerged from the original study by Bentele et al.. This fact may help us in our future work. Characterising the models used in our work, we can say that we saved our time working with the model by Neumann et al. derived from the BioModels database , and spent a lot of time to reproduce the model by Bentele et al. that had not existed in a ready-to-use format. Thus, we would like to emphasize that for the common benefit, the systematic application of biological standards in modeling (e.g. SBML  and SBGN ) and depositing the working models in public databases (e.g. BioModels ) would significantly facilitate analysis of existing biomathematical models and using them as the base for development of new composite systems. Finally, we believe that the composite model itself may be useful for further investigation of apoptosis. Mathematical modeling provides a powerful tool for studying the properties of biological processes. Methods of model reduction allowed us to take a first step towards validation of the modular model of apoptosis . Using these methods, we composed two models describing pathways of CD95- and NF-κB-signaling in one without affecting the fit to the experimentally measured dynamics and model predictions. For the model reduction and composition, we used the BioUML software that was extended by the required methods of analysis. The models by Bentele et al. and Neumann et al. reconstructed in BioUML and represented using SBML format and SBGN notation, as well as their reduced and decomposed versions are available at http://ie.biouml.org/bioumlweb/#de=databases/The%20composite%20model%20of%20CD95%20and%20NF-kB%20signaling. This work was supported by FP6 grant 037590 "Net2Drug", FP7 grant 090107 "LipidomicNet", EU FP7 (project APO-SYS) and Agence Nationale de la Recherche (project ANR-08-SYSC-003 CALAMAR). AZ is a member of the team “Systems Biology of Cancer,” Equipe labellisée par la Ligue Nationale Contre le Cancer. EK performed reduction, integration and analysis of the apoptosis models. AZ coordinated the model reduction part of the study. RS and FA coordinated the study of the apoptosis machinery. FA also led implementation of the analysis toolbox in the BioUML software. All authors have participated in writing and editing the manuscript, as well as read and approved the final manuscript.